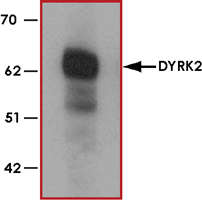 Sample Data :Western blot analysis of DYRK2 in 293 cell lysate with DYRK2 antibody at (A) 1 and (B) 2 ug/ml. 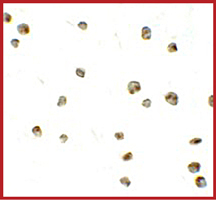 Sample Data :Immunocytochemistry of DYRK2 in 293 cells with DYRK2 antibody at 10 ug/ml. Scientific Background :DYRK2 (also known as dual-specificity tyrosine-(Y)-phosphorylation regulated kinase 2) belongs to a family of protein kinases whose members are presumed to be involved in cellular growth and/or development and is defined by structural similarity of their kinase domains and their capability to autophosphorylate on tyrosine residues. DYRK2 expressed in E. coli demonstrated tyrosine autophosphorylation and catalyzed phosphorylation of histones H3 and H2B in vitro (1). DYRK2 also regulates p53 to induce apoptosis in response to DNA damage (2). 1. Becker, W. et.al: Sequence characteristics, subcellular localization, and substrate specificity of DYRK-related kinases, a novel family of dual specificity protein kinases. J. Biol. Chem. 273: 25893-25902, 1998. 2. Taira, N. et.al: DYRK2 is targeted to the nucleus and controls p53 via Ser46 phosphorylation in the apoptotic response to DNA damage. Molec. Cell 25: 725-738, 2007.